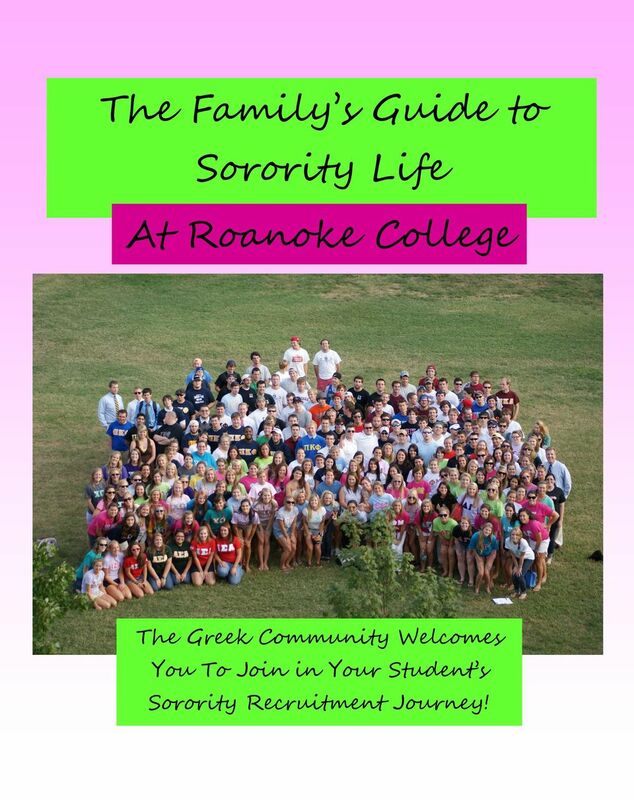 Download "The Family s Guide to Sorority Life At Roanoke College"
1 The Family s Guide to Sorority Life At Roanoke College The Greek Community Welcomes You To Join in Your Student s Sorority Recruitment Journey! 3 Roanoke College Panhellenic Sororities What is a Panhellenic Sorority? 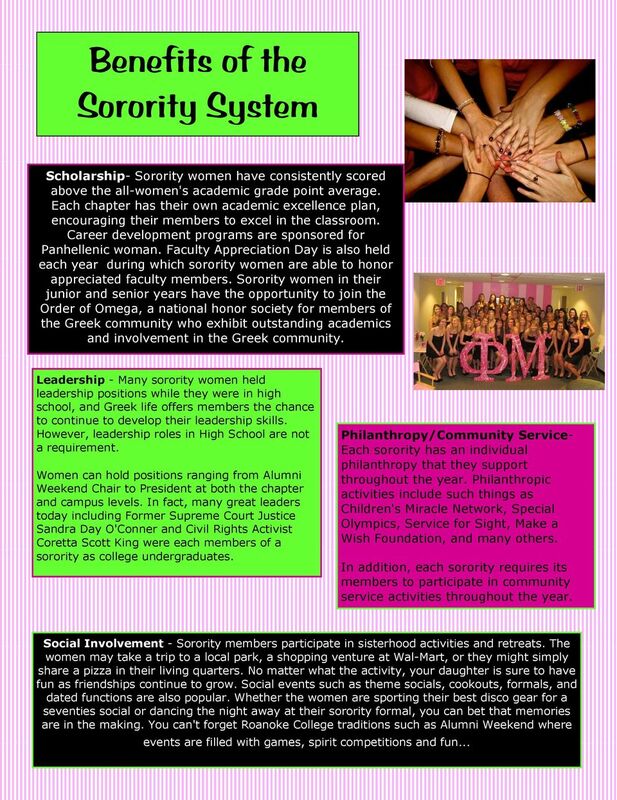 Panhellenic Council is the governing body of all the recognized women s social sororities on campus. They provide oversight and guidance to the sororities, program functions and special events for the Greek community, and run the Formal Sorority Recruitment process each January. What sororities does this include? 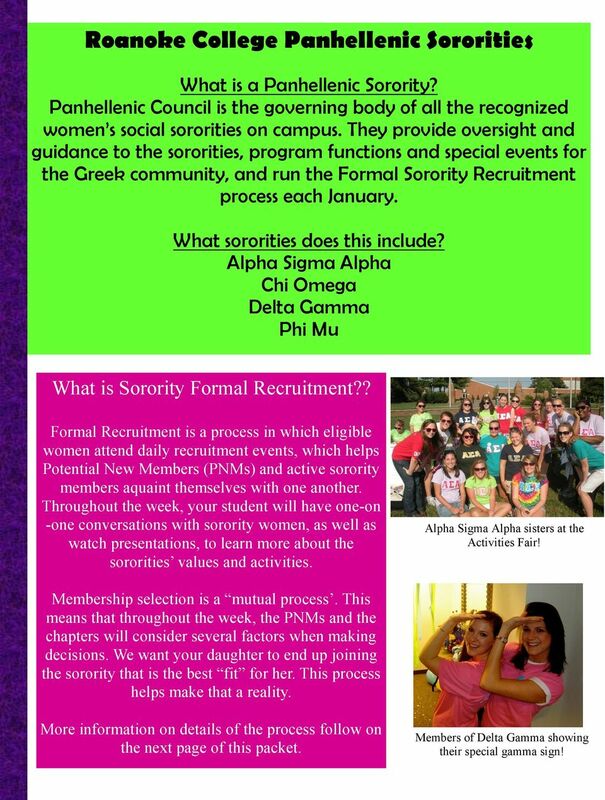 Alpha Sigma Alpha Chi Omega Delta Gamma Phi Mu What is Sorority Formal Recruitment?? Formal Recruitment is a process in which eligible women attend daily recruitment events, which helps Potential New Members (PNMs) and active sorority members aquaint themselves with one another. Throughout the week, your student will have one-on -one conversations with sorority women, as well as watch presentations, to learn more about the sororities values and activities. Alpha Sigma Alpha sisters at the Activities Fair! Membership selection is a mutual process. 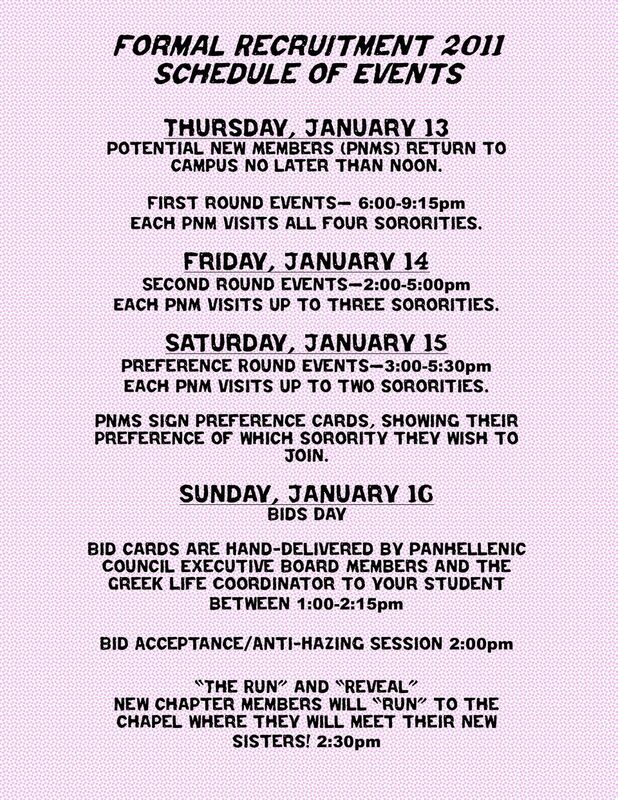 This means that throughout the week, the PNMs and the chapters will consider several factors when making decisions. We want your daughter to end up joining the sorority that is the best fit for her. This process helps make that a reality. More information on details of the process follow on the next page of this packet. Members of Delta Gamma showing their special gamma sign! 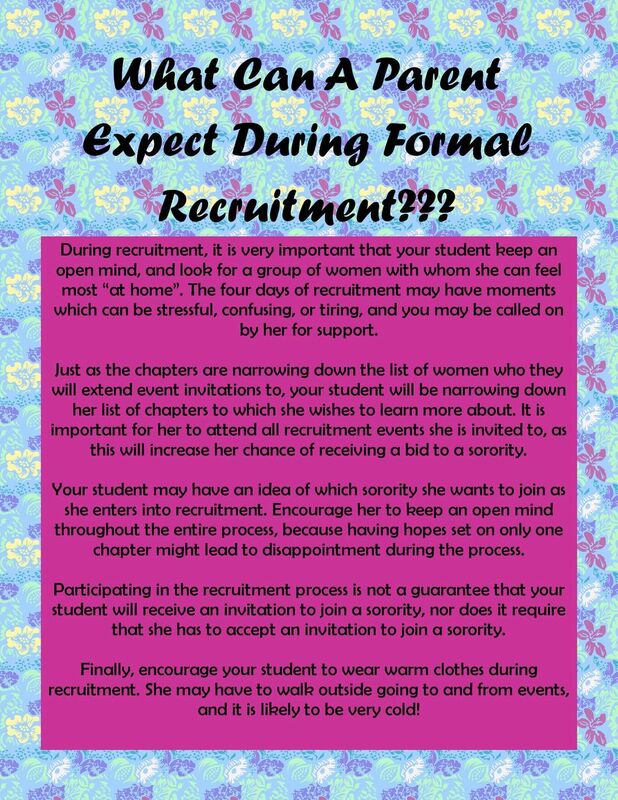 6 What Can A Parent Expect During Formal Recruitment??? During recruitment, it is very important that your student keep an open mind, and look for a group of women with whom she can feel most at home. The four days of recruitment may have moments which can be stressful, confusing, or tiring, and you may be called on by her for support. Just as the chapters are narrowing down the list of women who they will extend event invitations to, your student will be narrowing down her list of chapters to which she wishes to learn more about. It is important for her to attend all recruitment events she is invited to, as this will increase her chance of receiving a bid to a sorority. Your student may have an idea of which sorority she wants to join as she enters into recruitment. Encourage her to keep an open mind throughout the entire process, because having hopes set on only one chapter might lead to disappointment during the process. 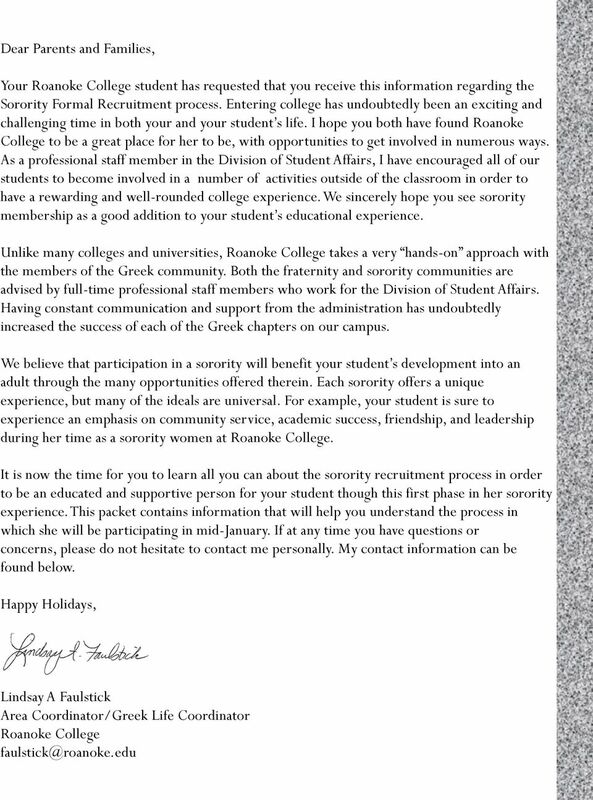 Participating in the recruitment process is not a guarantee that your student will receive an invitation to join a sorority, nor does it require that she has to accept an invitation to join a sorority. Finally, encourage your student to wear warm clothes during recruitment. She may have to walk outside going to and from events, and it is likely to be very cold! 7 Financial Obligations One question that many families have when their daughter is considering joining a sorority is, How much is this going to cost? Whether you pay their dues, help pay their dues, or have your student pay for her own dues, there is a financial commitment that comes along with joining a sorority. Each chapter sets their own dues cost each year and budgets to the penny what each dollar goes to pay for within the chapter. Dues typically pay for social functions (dances, sisterhood events, etc. ), new member fees (pin, national fees, initiation fees), member development (workshops, training sessions, academic incentives, etc. ), and other programs and events that each chapter puts on throughout the year. 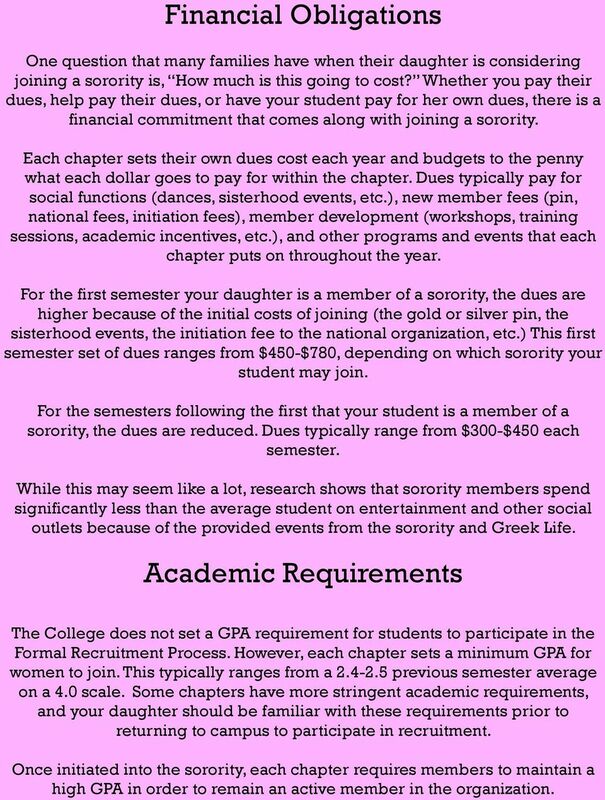 For the first semester your daughter is a member of a sorority, the dues are higher because of the initial costs of joining (the gold or silver pin, the sisterhood events, the initiation fee to the national organization, etc.) This first semester set of dues ranges from $450-$780, depending on which sorority your student may join. For the semesters following the first that your student is a member of a sorority, the dues are reduced. Dues typically range from $300-$450 each semester. While this may seem like a lot, research shows that sorority members spend significantly less than the average student on entertainment and other social outlets because of the provided events from the sorority and Greek Life. Academic Requirements The College does not set a GPA requirement for students to participate in the Formal Recruitment Process. However, each chapter sets a minimum GPA for women to join. This typically ranges from a previous semester average on a 4.0 scale. Some chapters have more stringent academic requirements, and your daughter should be familiar with these requirements prior to returning to campus to participate in recruitment. Once initiated into the sorority, each chapter requires members to maintain a high GPA in order to remain an active member in the organization. 8 Alcohol Policy The Roanoke College sorority system opposes the misuse of alcohol and maintains that all chapters, individual members, and guests abide by all local, commonwealth, and federal laws. Guidelines for social events involving alcohol are mandated by the national headquarters of each of our organizations. Additionally, possession of alcohol on our sorority s chapter premises is prohibited. Policy on Hazing Roanoke College prohibits hazing, as defined by the National Panhellenic Conference. Hazing is defined as "any action taken or situation with or without the consent that recklessly, intentionally or unintentionally endangers the mental or physical health or safety of a student, or creates risk of injury, or causes discomfort, embarrassment, harassment or ridicule or that willfully destroys or removes public or private property for the purpose of initiation or admission into or affiliation with, or as a condition for continued membership in, a chapter or colony of an NPC member [sorority]. Again, if you have any comments, questions, or concerns, please do not hesitate to contact Lindsay Faulstick in the Office of Student Affairs. We believe that families are a crucial component in the success of our college students. Participation in their academic and social progress is beneficial to your daughter, the College, and to you! Application Women of Excellence Leadership Series 2013 Class The Women of Excellence Leadership (WEL) Series is for juniors and seniors only. Spring Study Abroad students are not eligible for consideration. The 25 th Annual MBA Games Weekend. Overview Brochure. Network. Have Fun. Give Back. The 25 th Annual MBA Games Weekend Overview Brochure Network. Have Fun. Give Back. Who We Are: A Bit of History: We Want You! Thank you! Thanks for considering attending this year s MBA games weekend! Why Vanderbilt? - Vanderbilt University - College Review Essentials: Students typically spend Sunday in the library and Tuesday and Thursday evenings participating in a Greek sponsored event of some sort. Choose. Criminal Justice. at UCM.